Thomas was born on 27 March 1807 at Kibblesworth, Co Durham,to parents Henry and Ann. The family moved to Beamish, Co Durham when Thomas was very young. He was sent down the coal pit as a child and grew to be a strong and energetic youth. He strayed into becoming a ringleader of the sports (pugilism). Thomas attended camp meetings and some prayer meetings out of curiosity. He found peace through believing at a prayer meeting in the house of James Porteus. Thomas joined with the Pit Hill Society. Shortly after his conversion, Thomas became an exhorter on the plan. He was a local preacher and class leader at Pit Hill for ten years before finally responding to the call to become an itinerant minister. Thomas particularly enjoyed missionary appointments, going to the Channel Islands and Ireland. Despite misgivings about Ireland, he found his time in Belfast one of the most enjoyable in his ministry. When he died, Moses Lupton, then President of Conference, and earlier his first Superintendent, wrote that Thomas was a Christian man and a devoted, earnest and useful preacher. 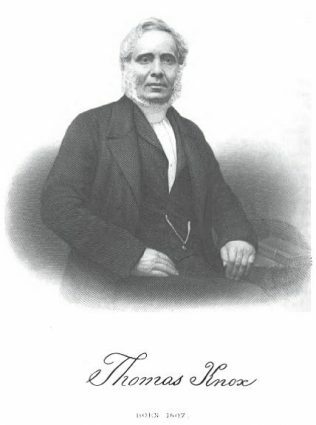 Another colleague, William Garner, wrote that his sermons were evangelical, plain and faithful. Thomas married Rosanna Ellis (1809-1884) on 29 June 1840 at St James Great Grimsby, Lincolnshire. Records identify five children. Thomas died on 8 June 1870 at West Hartlepool, Co Durham.